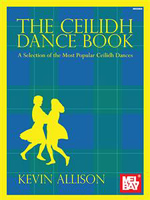 While one of a kind is a hard rating to achieve at Mel Bay Publications, Kevin Allison has done it with The Ceilidh Dance Book. A ceilidh is a traditional Scottish gathering where people share songs, stories, music, and dancing that is very much alive today. In Scotland, there are hundreds of ceilidh bands, each of which has their own trademark tune sets, making it possible for a man in a kilt to make a living as a performing musician. This book not only provides 85 Scottish tunes in sets as they might be used in a ceilidh event_it also offers detailed, beat-by-beat descriptions of the dance steps for twenty-four dances! From The Highland Scottish to The Mooncoin Jig, with this book inhand, you'll be able to both play in the band and step to the music with the locals. The kilt is optional.